Rationalist Judaism: Another New Camel Species! 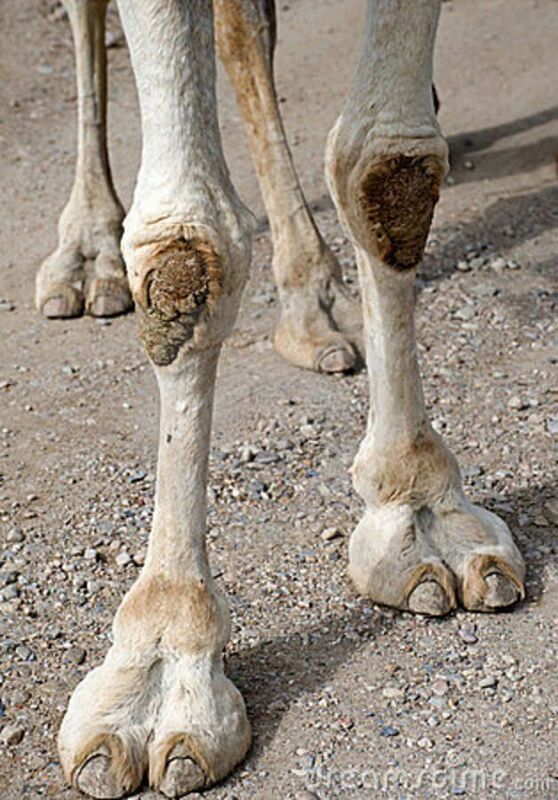 So here again we have a mistaken conception of what a camel's foot looks like. And it's for the same reasons as the other fabrication. First, there is a mistaken translation of the passuk (due to the lack of realization that there are two different approaches to translating mafris parsah, and according to neither does it mean "split hoof"). Second, there is a lack of effort to actually look at the physical reality and see if the illustration makes any sense. Among mammals, you may eat [any one] that has true hooves that are cloven and that brings up its cud. However, among the cud-chewing, hoofed animals, these are the ones that you may not eat: The camel shall be unclean to you although it brings up its cud, since it does not have a true hoof. true hooves (Saadia; Rashbam; Ibn Ezra; Ibn Janach; Ralbag). Maphreseth parsah in Hebrew. Or, 'that has cloven hooves' (Targum; Rashi; Radak, Sherashim). does not have a true hoof The hooves of the camel are so reduced that they are like claws, and the padded soles support most of the weight. Some, however, understand the padded sole to be the 'hoof' here, and translate it, 'does not have a cloven hoof' (Rashi). Rabbi Kaplan notes that the camel does not have a true hoof at all. I'd argue that correspondingly, it's more correct, according to Rashi's approach, to translate parsah as "foot" or "sole" rather than "hoof." The truth is, it doesn't actually matter terribly much if someone has the wrong idea as to why a camel is not kosher. But if you're going to the effort of producing illustrations to explicate the passuk, what's the point of giving illustrations that are hopelessly mistaken? 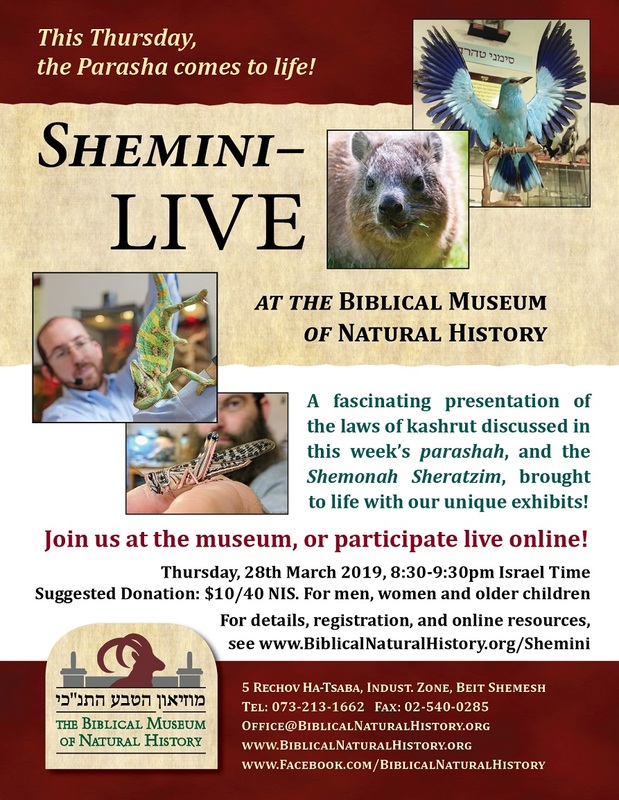 Meanwhile, if you'd like to get a real-life understanding of the topics of kashrut and the shemonah sheratzim that appear in this week's parashah, sign up for Shemini - Live From The Biblical Museum of Natural History! You're simply choosing to make up your own interpretation of what these words mean and ignoring the approach of all the Rishonim. The camel is NOT mafris parsah. That passuk means "these you cannot eat from those which bring up the cud (i.e. the camel hare hyrax) and which have hooves/ split feet (i.e. the pig)." Recall the Daas Zekanim m'baalei Hatosofos who clearly understand the possuk as I'm saying - the question he asks is why doesn't it say that camel is not Kosher because it's not shosaas shesa. Obviously he feels it's mafreses parsah. First of all, even if you were correct, that would mean that you have a single authority who learns the passuk that way - hardly a proof that the passuk *must* mean that. Second, you're not even correct. Daas Zekenim is simply asking a question on Rashi. Firstly, the daat zekenim does not comment on Devarim 14:6 or 14:7. Furthermore, RNS said you mistranslated 14:7 (not 14:6), which is the verse that says "but from these you may not eat...". The parallel verse in Vayikra is 11:4, which also has no comment from the daat zekenim. The actual verse that Daat Zekenim comments on is Vayikra 11:3. So there you go "flippantly" quoting early commentaries with the wrong source, and showing them complete disrespect. You should be ashamed. RNS is absolutely correct in that the DZ on this verse is merely questioning Rashi's interpretation. The perfect example of "flippant disregarding of Amorayim and Rishonim" is you. Not only do you misquote the location of their comments, you completely misunderstand them and then desperately attempt to cover up your own wrongdoings by saying that it was the rishonim who said them and that we are disrespecting them. The only people that are being disregarded here are those who make moronic statements and who simply have a backwards understanding of the Rishonim, Torah, and the entirety of Judaism. If you want to be part of that group, then Hashem yirachem. I thought it was funny when I saw that as a kid. LL: What the Torah is saying by Shtei Ferasos, means that the hooves need to be split (SS) into TWO separate hooves. Nothing is said about "two toes". Pretend that there is a lamed before the word shtei. The Torah in pasuk daled is saying (that of the 3 Simanim, MP, SS and MG;) you may NOT eat the Gamal, because although it is MG, it is is not MP (hooved). (pasuk heh) And the Shafan is MG, but not MP (hooved) so you may not eat it. (pasuk vav) And the Arneves is MG, but not MP, so you may not eat it. The Torah needn't discuss SS, as there is no point in saying you don't have a split hoof if you don't have a hoof in the first place. 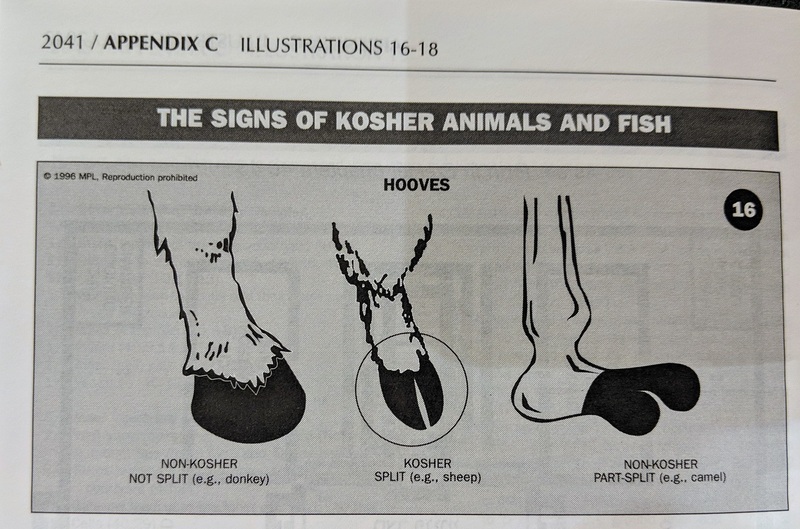 Lastly, pasuk 7 says that the Chazir is MP (hooved) and the hooves are split (SS) but you can't eat it because it is not MG.
MO: -The camel is clearly "וּמִמַּפְרִיסֵ֥י הַפַּרְסָ֖ה"
MO: as well it also fits the requirement of the two toes. 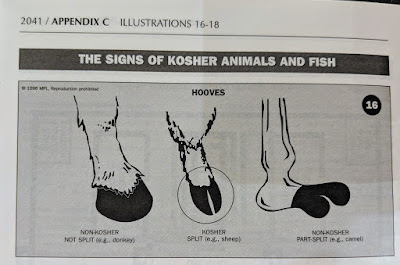 Forget how science equates or differentiates between hooves and ungulates - the Torah however clearly sees them as being related and qualified as "וּמִמַּפְרִיסֵ֥י הַפַּרְסָ֖ה"
MO: Recall the Daas Zekanim m'baalei Hatosofos who clearly understand the possuk as I'm saying - the question he asks is why doesn't it say that camel is not Kosher because it's not shosaas shesa. Obviously he feels it's mafreses parsah. LL: The Daas Zekanim's question is only relevant if you learn like Rashi, but if you learn like RSG, Rashbam and company, this question disappears. How can DZ understand the Gamal to be MP when the TORAH clearly says that it ISN'T???? The nature of Judaism, even the charedi worldview, is to disregard certain points that either don't fit the narrative one wishes to make or aren't supported by most authorities. Do you follow the opinion of every amora, rishon, and acharon who ever wrote about the Torah? The Sifri learns like RSG and countless rishonim. The one here who is flippantly discounting all these rishonim is you. And btw, Rashi disagrees with Onkelos many times. How can he dismiss this close interpretation of Torah???? No one is saying that Rashi's explanation is bad. 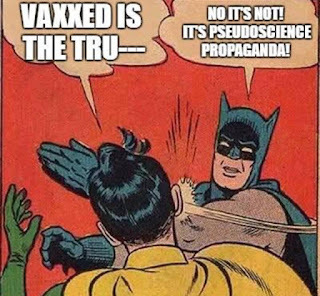 You are the one who dismisses every other explanation which happens to disagree with you, and then declare we are all wrong just because you don't favor them. And Biblical interpretation is in the domain of every Jew. That's what my version of Pirkei Avos says, anyway. For someone who thinks he knows a lot, you sure don't know your history. Onkelos was not in the times of the Amoraim. Also, you are not modern orthodox so please stop pretending to be. That's sheker.
" A charming old tale, whose origins are lost in time, speaks of a heated debate among scholars debating the number of teeth in a horse's mouth. After many days and nights of arguing, a novel solution is propounded: head to the nearest stable and count! The outrageous proposal is met with frowns and disgust, and the scholars are doomed to continue the debate forever more." Ironically, it was the Rashbam who posited the (false) realia of of the trachea to the left of the esophagus to explain a textual difficulty in the Gemara around danger of leaning in the wrong direction on Pesach, something that continues to infect the halacha until this day. Perhaps someone can write a book (Artscroll) about it. I googled "cartoon camel" as you suggested and surprisingly large number were drawn with hooves.